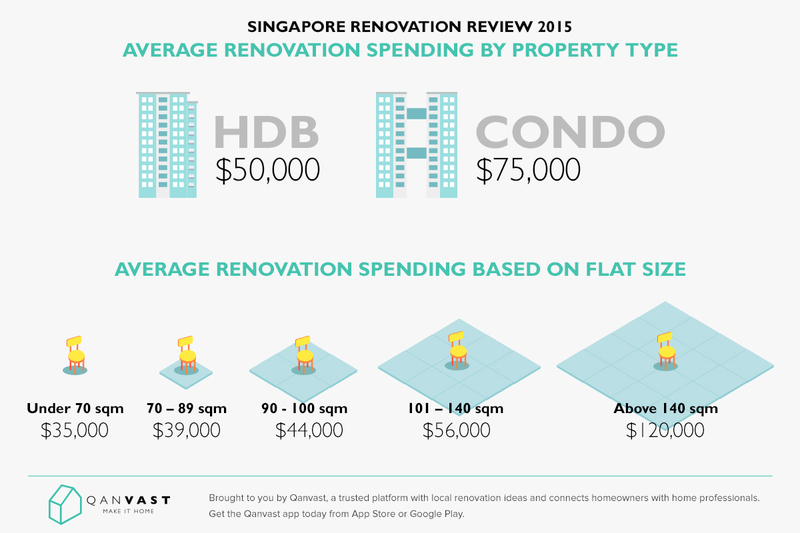 Are Singaporeans Spending More Or Less On Renovation In 2015? 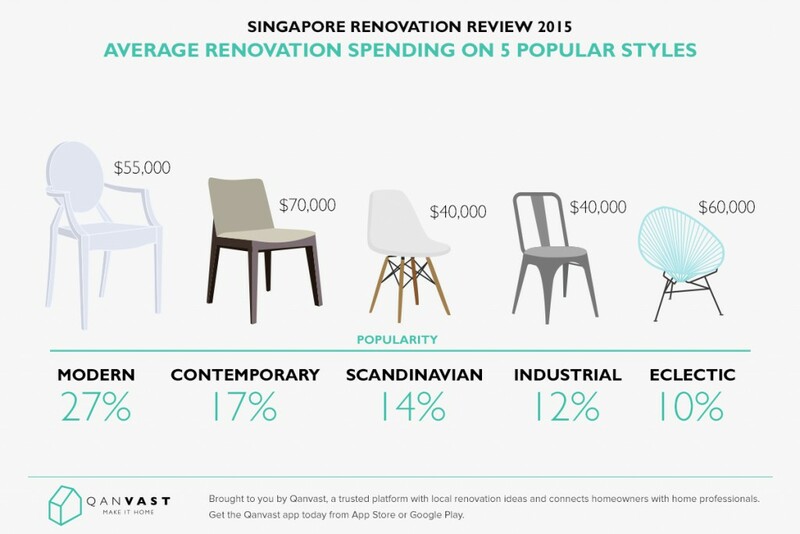 Considering a home renovation in Singapore? Instead of having to figure how much to set aside, here’s a basic estimate on the average renovation spending over the years and districts based on data collected by Qanvast. 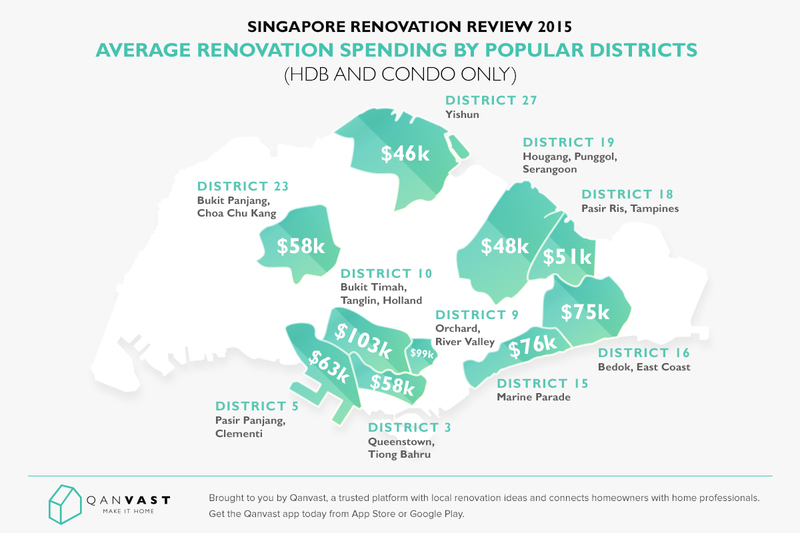 Luxury property market in District 10 remains to have highest renovation spending of $100,000. 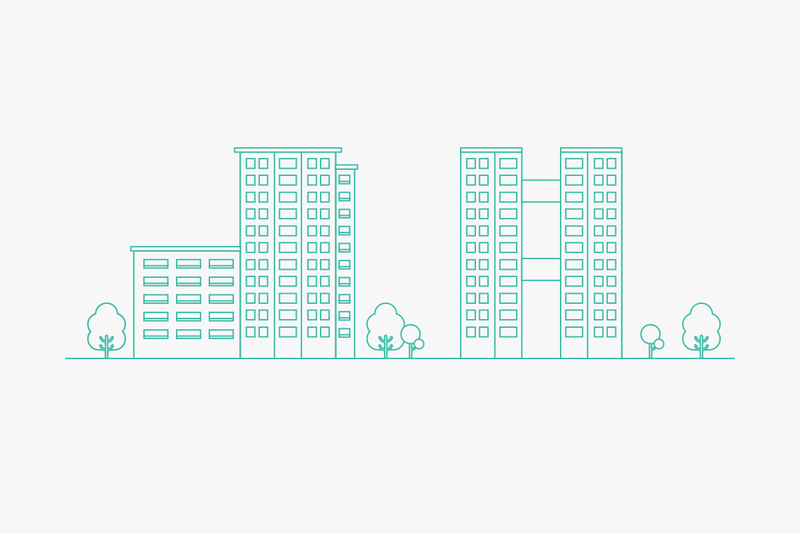 Mature estates see an average spending between $60,000 to $75,000, likely due to the bigger volume of resale flats (note: resale flats typically cost more to renovate). 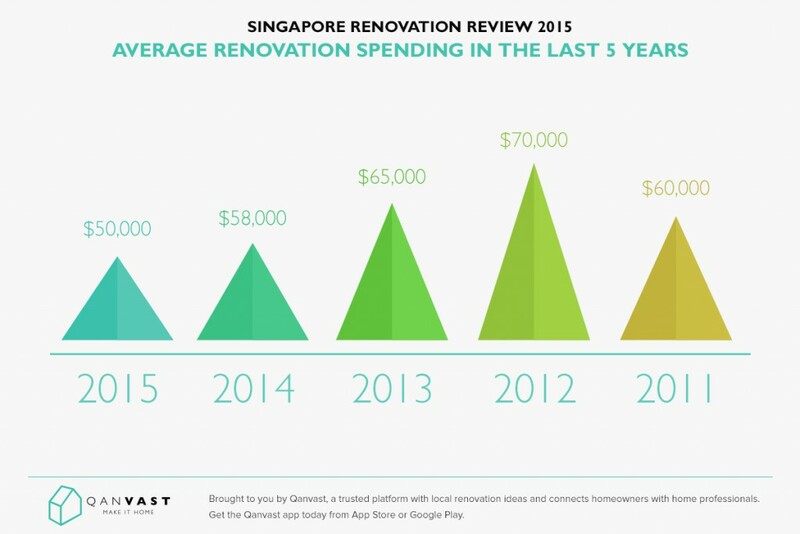 Non-mature estate renovation spending is set at an average of $50,000. More young homeowners (or first jobbers) are buying their first property and this leads to a smaller renovation budget. Wedding and home renovation tend to also come one after another, leading to a tighter financial budget for new homeowners. Floor areas are getting smaller hence the amount of renovation required is lesser. Homeowners are unwilling to spending on renovation as they are planning to upgrade their home within the next few years. Condominium homeowners spent $25,000 more than HDB homeowners when it comes to renovation. Renovation spending is generally calculated by floor size. For larger apartment units (e.g. masionette, duplex, penthouse etc) renovation spending is significantly doubled. Interior style plays a factor in the overall renovation spending. Timeless interior designs such as modern and contemporary style remain a strong stay in Singapore. Trendy preppy design styles such as Scandinavian and industrial remain popular amongst young homeowners. These design styles are also more budget-friendly as the design element is based on utilising loose furniture in comparison to built-in carpentry. Note: Renovation costs exclude furnishing and appliances. All figures denoted here are in Singapore Dollars. If you need help to connect with interior designers, look no further. Simply drop us a complimentary quote request and we can match you with interior firms who can match your budget and requirements. Speak to us today! This article appears on Qanvast’s Branded Page on Vulcan Post.